Today our book "California Winetopia" was released. Woo hoo! After writing this I'm about to open the best bottle of bubbly in the house. Of course, if you're reading this, you may not be able to read the book, as it's in Japanese only. 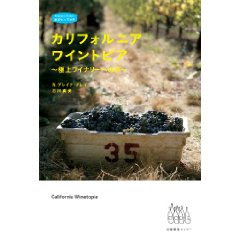 It's a guide to northern California wines and wine country, and hopefully it fills a niche in the market as there is very little on these topics currently published in Japanese. About the cover shot: Though I turned in dozens of photos, the publisher didn't think any of them worthy of the cover. They wanted something with grapes, but no people. So I spent two days in Napa and Sonoma County doing nothing but shooting beautiful vineyards. On the first day, my car broke down on Dry Creek Road in the middle of nowhere and I had to be towed back to San Francisco. The next day I borrowed my friend Steve's car and shot all day long, taking countless photos: landscapes, vine closeups, you name it. Sent 'em all to Japan. That cover shot you see was graciously provided to us by Seghesio Family Winery. As a book-cover photographer, I guess I'm still a fairly decent writer. Hopefully even in Japanese. So a heartfelt thanks to Seghesio and to all the other wineries, restaurants and hotels that generously allowed us to use their photos of their properties. I wanted to convey not just the deliciousness, but also the beauty of California wine country, and you helped to do that. I only wrote about (and requested photos from) placesI like, so I hope that a few extra Japanese visitors will find their way to you. I also need to thank and acknowledge my wife and co-author, Mami Ishikawa Gray, without whom this book would never have happened. For some reason Amazon Japan insists on listing her as the translator, but that's simply not true. If there are any charming word choices in the book, they are hers. If you really want a copy, it's available via Amazon Japan (although in two weeks it should be available at Kinokuniya bookstore in San Francisco's Japantown.) Now we've got a bottle of bubbly to open. Banzai! Congrats Bureiku and Mami. What bubbly did you drink? You know, it should probably have been Schramsberg, given the book, but in fact it was Egly-Ouriet Blanc de Noirs. And thank you very much for opening beautiful bubbly! Today a charming couple from Japan visited our tasting room with a copy of your book which they had used to find us. They had a great time and took away a bottle or two. Like you, my son is married to a Japanese girl and we have two beautiful Japanese grandchildren. I am pleased that through your efforts we can meet people from Japan and share a little of our culture with them. Thanks.